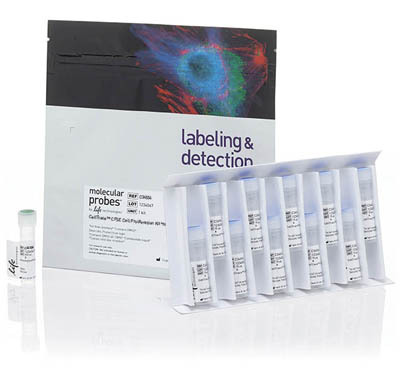 CellTrace™ CFSE Cell Proliferation Kit is used for in vitro and in vivo labeling of cells to trace multiple generations using dye dilution by flow cytometry. View a selection guide for all CellTrace™ Cell Proliferation Kits for flow cytometry. Successful proliferation analysis by dye dilution (see figure below) requires an extremely bright dye to distinguish fluorescently labeled cells from auto-fluorescence after several cell divisions. The intense fluorescent staining provided by CellTrace™ CFSE dye enables the visualization of eight or more generations of proliferating cells before the signal is overwhelmed by intrinsic cellular auto-fluorescence. Consistent, homogeneous staining results in very little fluorescence variation between cells in a population, so distinct generations can be seen without any requirement for complex modeling software. Unlike stains that label the lipid membrane of cells, CellTrace™ CFSE dye easily crosses the plasma membrane and covalently binds inside cells where the stable, well-retained fluorescent dye is designed to provide a consistent signal, even after several days in a cell culture environment. CellTrace™ CFSE dye binds covalently to all free amines on the surface and inside of cells and shows little cytotoxicity, with minimal observed effect on the proliferative ability or biology of cells. Researchers have used CFSE SE labeling to show that transplantable hematopoietic cells proliferate in vitro in response to stimulation by a growth factor cocktail. The CellTrace™ CFSE Cell Proliferation Kit contains convenient single-use vials of dry dye to permit small-scale experiments without preparing excess quantities of dye. A stock solution is prepared by dissolving the contents of a vial in anhydrous DMSO prior to use. To stain 1 mL of cells in protein-free medium, 1μL of this stock solution is typically used. Cells should be stained for 20 minutes at room temperature with gentle agitation. A brief wash with complete medium will then quench any dye remaining in solution.